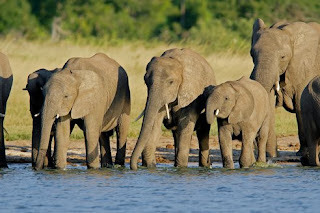 Conservationists call it the worst single southern Africa wildlife massacre in the last 25 years. "After the elephants died, often collapsing just a few yards from the source, lions, hyenas and vultures which fed on their carcasses were also struck down, as were other animals such as kudu and buffalo that shared the same waterholes. In 2011, at least 17,000 African elephants were killed for their tusks according to Cites, the international body that focuses on endangered species."